The document specifies that the Moto C2 will have a display between 5 and 5.2-inches. Lenovo-owned Motorola had earlier launched a new series of smartphones called the Moto C back in June last year. Now Motorola hasn't said anything about a second-gen Moto C device, but, it would seem that according to some reports the Moto C2 could actually be an Android Go smartphone. For those who are not aware, Android Go happens to be a modified version of the Android OS which is optimised to run on devices with up to 1 GB RAM or less and a low-performing chipset. As per a report by Gizmochina, this Android Go news is not confirmed. However, since the hardware on the device specifies 1 GB of RAM and 16 GB of storage, it would make sense for Motorola to opt for the Android Go program. As per the FCC documents, the Moto C2 has the model number XT1920 and inside the device, we are expected to find a battery between 2,000mAh and 2,100mAh. As far as the display goes, the document specifies that the phone will have a display between 5 and 5.2-inches. Since Moto C2 is going to be a near entry-level budget smartphone, expect thick bezels on the top and bottom of the device, and no notch. 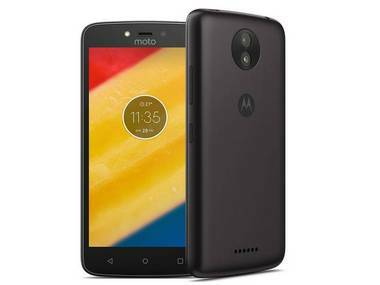 The phone is touted to have the same optics as seen in the previous Moto C smartphone.